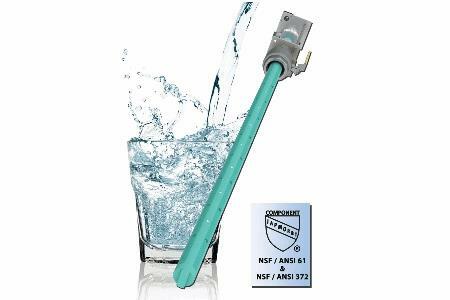 McCrometer’s FPI Mag® meter is now NSF/ANSI-61 and NSF/ANSI-372 certified for municipal drinking water applications. In the U.S. and around the globe, municipalities and other water authorities have confidence knowing this instrument meets or exceeds the highest standards in water measurement from source to tap. Federal and state agencies which regulate drinking water require that every component of potable water systems, including flow meters, meet NSF/ANSI-61: Drinking Water System Components – Health Effects standards. The FPI Mag has completed and passed the certification process, which involves specialized inspections, destructive testing, and rigorous scrutiny to ensure all parts of a flow meter that come into contact with water are safe and will not become a contaminant. “When our customers inquired about certifying the FPI Mag to meet these important water quality standards, McCrometer answered, ‘Yes, we can’. McCrometer is known for innovating products for unique applications, and the FPI Mag is no exception. Our commitment to clean water and the environment is at the highest level,” said Aimee Davis, Product Manager for McCrometer. McCrometer’s FPI Mag meter received NSF/ANSI-61 and NSF/ANSI-372 approvals after rigorous third-party testing by IAPMO R&T. The approvals are now documented online by IAPMO R&T for the National Science Foundation (NSF) under Files W10097 (NSF/ANSI-61) and W10098 (NSF/ANSI-372). The FPI Mag meter is designed with electromagnetic flow sensor technology for best in class accuracy: ± 0.5% from 1 ft/s, up to 32 ft/s (0.3 m/s to 10 m/s). Featuring ease of use and total cost savings, it is suitable for a wide range of municipal and industrial applications, including capital or maintenance projects, retrofits and sites never metered. The FPI Mag is available in battery or solar powered configurations for forward flow sensors, enabling installation in remote applications without access to power. This meter’s advanced Smart Output™ capability connects to the industry’s most popular AMI/AMR systems through an encoded digital output. The insertion design of the FPI Mag allows for hot tap installation, which means the meter can be installed without interrupting service, de-watering lines, cutting pipe, or welding flanges. Users save up to 45% on installation and the total cost of ownership vs. a full-bore flanged meter. This is due to the simplified installation and maintenance required, as well as less labor and heavy equipment needed during installation. The multi-electrode water flow sensor’s single-piece design has no moving parts and contains nothing to wear or break. The FPI Mag is available with forward-flow only or bi-directional measurement for line sizes 4 to 138 inches. The flow sensor body is made from heavy-duty 316 stainless steel for maximum structural integrity, is hermetically sealed and protected by an NSF certified 3M fusion-bonded epoxy coating. It is also certified by CSA to UL 61010-1 and CSA C22.2 No. 61010-1-04 and is manufactured to an ISO 9001:2008 quality management system. McCrometer’s advanced flow measurement solutions solve complex challenges in Municipal/Industrial Water & Wastewater, Agricultural Irrigation, Oil & Gas, Process Control, Electric Power Generation and Institutional Facilities. The company’s products and systems are found in thousands of installations worldwide. Its products and systems meet many of the world’s most demanding industrial, safety and quality standards. For more information, visit www.mccrometer.com.